Background & objectives: Malaria is a deadly parasitic disease, having a high rate of incidence and mortality across the world. The spread and development of resistance against chemical insecticides is one of the major problems associated with malaria treatment and control. Hence, plant based formulations may serve as an alternative source towards development of new drugs for treatment of malaria. The present study was aimed to evaluate the in vitro antiplasmodial activities of leaf, stem and flower of Calotropis gigantea against chloroquine-sensitive Plasmodium falciparum (3D7 strain) and its cytotoxicity against THP-1 cell lines. The plant extract which showed highest potency, in the in vitro antimalarial activity was further tested in vivo against P. berghei (ANKA strain) for validating its efficacy. Methods: The crude extracts of methanol, ethyl acetate and chloroform from leaves, stem and flowers of C. gigantea were prepared using Soxhlet apparatus. These extracts were screened for in vitro antimalarial activity against P. falciparum 3D7 strain. The cytotoxicity studies of crude extracts were conducted against THP-1 cell line. Phytochemical analysis of these extracts was carried out by following the standard methods. The damage to erythrocytes due to the plant extracts was tested. The in vivo study was conducted in P. berghei (ANKA) infected BALB/c albino mice by following the 4-day suppressive test. Results: The phytochemical screening of the crude extracts showed the presence of alkaloids, flavonoids, triter-penes, tannins, carbohydrates, phenols, coumarins, saponins, phlobatannins and steroids. Out of all the extracts, the methanolic extract of leaves showed highest antimalarial activity with IC50 value of 12.17 μg/ml. In cytotoxicity evaluation, none of the crude extracts, showed cytotoxicity on THP-1 cell line. Since, methanolic leaf extract of C. gigantea showed good antimalarial activity in vitro, it was tested in vivo. In the in vivo results, the methanolic leaf extract of C. gigantea exhibited an excellent activity against P. berghei malaria parasite, wherein the decrement of parasite counts was moderately low and dose-dependent (p < 0.05) in comparison to the P. berghei infected control group, which showed a daily increase of parasitaemia unlike the chloroquine-treated group. Interpretation & conclusion: The methanolic leaf extract of C. gigantea may act as potent alternative source for development of new medicines or drugs for the treatment of drug-resistant malaria. Thus, further research is needed to characterize the bioactive molecules of the extracts of C. gigantea that are responsible for inhibition of malaria parasite. Historically and traditionally, plant parts have always been used as an important source for development of medicines against malaria and other diseases. Most effective antimalarial drugs such as chloroquine, quinine and artemisinin are derived from plants. The first effective antimalarial drug, quinine was extracted from Cinchona tree; based on which chloroquine and primaquine were synthesized. An another effective drug artemisinin was extracted from an herbal tree, Artemisia annua in 1972. Drug resistance is a growing problem for malaria treatment in the 21st century. In the context of a high disease burden, the development of resistance has a major influence on the control of malaria in affected countries. Resistance against chloroquine was reported long back in Thailand in 1957, which consequently spread all over the world; with first report from India in 1976. Due to the reports of resistance, the most malaria endemic countries have stopped using chloroquine as the first line of treatment for malaria. At present, artemisinin and its derivatives are used as first line of treatment. Unfortunately, artemisinin-resistant strains have been also reported from Thai-Cambodia region in 2009, highlighting the need for new antimalarials. Hence, the World Health Organization has recommended artemisinin and its derivatives in combination with other drugs such as amodiaquine, mefloquine, lumefantrine, and sulphadoxine-pyrimethamine (SP) as the first-line therapy for malaria worldwide. The efficacy of the plant based products has encouraged the search for novel plant-derived antimalarial drugs/remedies. Thus, the present investigation was focused to study the antimalarial activity of Calotropis gigantea, a plant with several medicinal properties. The flowering plant, C. gigantea is a well-known plant, belonging to the family of Apocynaceae and subfamily of Asclepiadaceae. It is found throughout the tropical and subtropical parts of Asia and Africa. These plants are commonly known as milkweeds and native to the countries of Bangladesh, Myanmar, China, India, Indonesia, Malaysia, Pakistan, Philippines, Thailand and Sri Lanka. The plant C. gigantea is a large shrub growing up to 4 m (13 ft) tall. It has clusters of waxy flowers that are either white or lavender in colour. Each flower consists of five pointed petals and a small, elegant “crown” rising from the centre, which holds the stamens. The aestivation found in C. gigantea is valvate, i.e. sepals or petals in a whorl just touch one another at the margin, without overlapping. The plant has oval, light green leaves and milky stem. The latex of C. gigantea contains cardiac glycosides, fatty acids, and calcium oxalate. Calotropis gigantea is commonly available in India and used for several medication purposes in traditional medicinal system. Hence, the purpose of the present study was to investigate the in vitro antimalarial activity of plant extracts of C. gigantea against Plasmodium falciparum (3D7 strain) along with its cytotoxicity against THP-1 cell line. The plant extract which showed potent in vitro antimalarial activity was further tested for in vivo antimalarial activity against P. berghei (ANKA strain) in experimental BALB/c mice. Fresh samples of leaves, stem and flowers of C. gigantea were collected from the Acharya Nagarjuna University Campus, Guntur district, Andhra Pradesh, India [Figure 1]. The confirmation of the plant species was done by Prof. S. M. Khasim, Department of Botany, Acharya Nagarjuna University. All the collected plant parts were washed with tap water and distilled water to confiscate the dust and adhering materials. 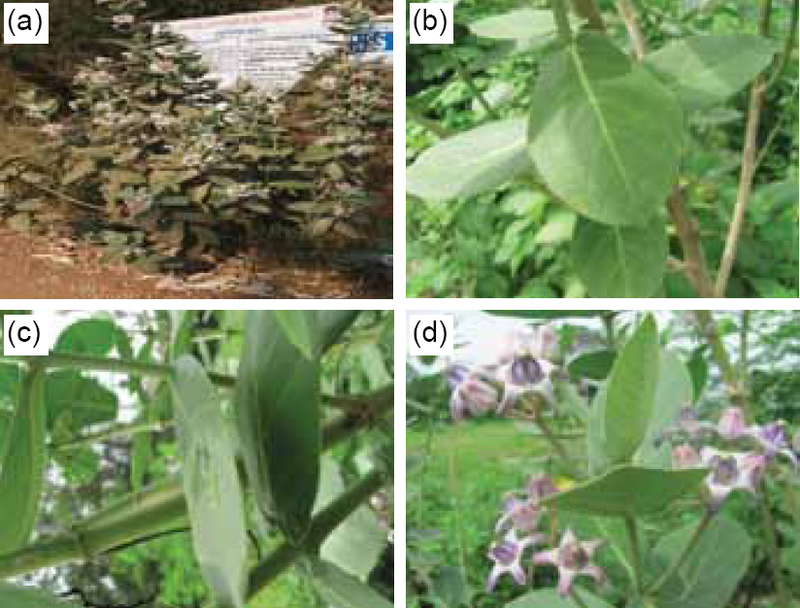 Figure 1: Calotropis gigantea L. plant and its parts—(a) Whole plant; (b) Leaf; (c) Stem; and (d) Flower. The plant extracts were screened for the presence of phytochemical constituents by following the method of Sofowora and Kepam. The plant extracts were dissolved in dimethyl sulphoxide (DMSO) and were filtered through ‘millipore sterile filters’ (mesh 0.20 μm; Sartorious Stedim Biotech GmbH, Germany). The plant extracts were screened for antiplasmodial activity against chloroquine sensitive P. falciparum 3D7 strain obtained from ongoing cultures in the research laboratory of Zoology Department of the University which were cultured according to the method of Trager and Jenson in candle jar desiccator. 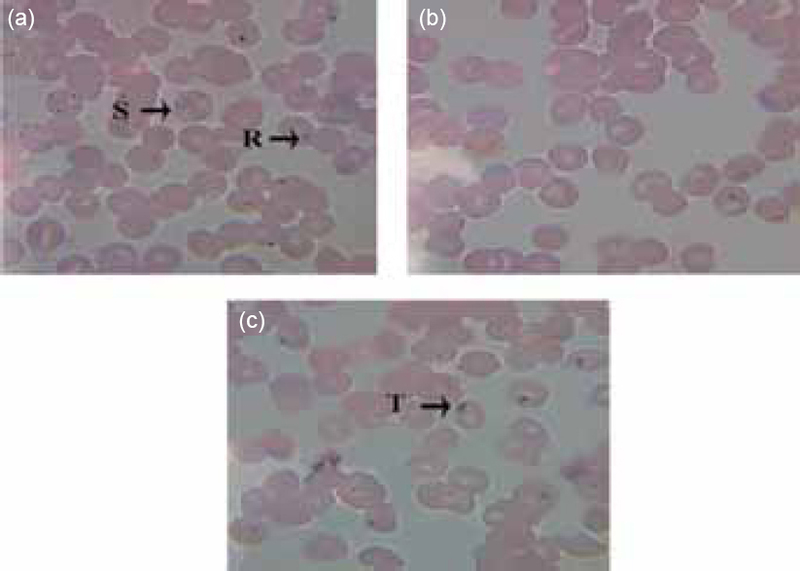 The P. falciparum culture was further cultivated in human ORh+ red blood cells using RPMI 1640 medium (Sigma Laboratories Private Limited, Mumbai, India) supplemented with ORh+ serum (10%), 5% sodium bicarbonate and 50 μg/ml of gentamycin sulfate. Haematocrits were adjusted at 2% and cultures of parasite were used when they exhibited 2% parasitaemia. The P. falciparum malaria parasite culture suspension of 3D7 (synchronized with 5% sorbitol to ring stage) was seeded (200 μl/well) in 96-well tissue culture plates. The plant extracts (methanol, ethyl acetate and chloroform of leaf, stem and flower) of C. gigantea were added to these wells in different concentrations (100, 50, 25, 12.5 and 6.25 μg/ml). Chloroquine treated parasites were kept as ‘control positive’ and DMSO treated parasites were kept as ‘control negative’ groups. The parasites were cultured for 30 h in candle jar desiccator. The cultures were incubated at 37 °C for 48 h in presence of 2% O2, 5% CO2 and 93% N2. After 18 h (before termination of the assay), [3H] Hypoxanthine (0.5 μ Ci/well) was added to each well. The effect of extracts in the cultures was evaluated by the measurement of [3H] Hypoxanthine absorption into the parasite nucleic acids. Each treatment had four replicates; at end of the experiment, one set of the parasite infected red blood cells was collected from the wells and blood smears were prepared. These smears were stained with acridine orange (AO) and Giemsa stain. Stained smears were observed under UV illumination microscope (Carl Zeiss, Bengaluru, India) for confirmation of [3H] Hypoxanthine assay. The experiment was terminated and the cultures were frozen and stored at -20°C. The parasites were harvested on glass filter papers using NUNC cell harvester and count per minute (CPM) was recorded in gamma scintillation counter. Control readings were considered as 100% parasite growth and the parasite inhibition was calculated for plant extract treated samples. The parasite inhibition was calculated as follows. The inhibitory concentrations, IC50 values were determined by plotting concentration of extract on X-axis and percentage of inhibition on Y-axis with dose-response curves using Minitab statistical analysis software package, version 11.12 (32 bit). The in vitro antiplasmodial activity of the extracts was categorized into four groups based on IC50 value, i.e.< 5 μg/ml: Very active; 5–50 μg/ ml: Active; 50–100 μg/ml: Weakly active; and >100 μg/ ml: Inactive. 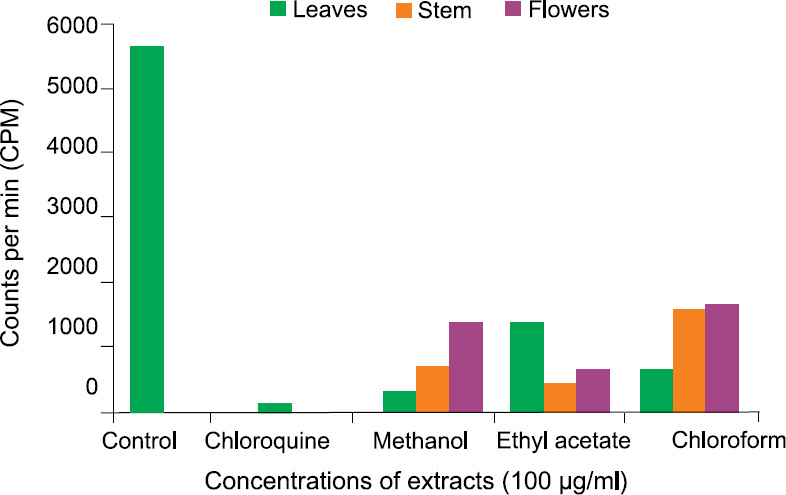 Cytotoxic properties of these crude extracts (methanol, ethyl acetate and chloroform of leaf, stem and flower) of C. gigantea were assessed by functional assay using THP-1 cell line. The cells were cultured in RPMI-1640 medium containing 10% fetal bovine serum, 0.21% sodium bicarbonate (Sigma-Aldrich, Ahmedabad, India), and 100 μg/ml penicillin and 50 μg/ml gentamicin (complete medium from Sigma-Aldrich, Ahmedabad, India). Briefly, cells (0.2×106 cells/200 μl/well) were seeded into 96-well culture plates in complete medium. The plant extracts in different concentrations (100, 50, 25 and 12.5 and 6.25 μg/ml) were added after 24 h of seeding and incubated for 48 h in a humidified atmosphere at 37°C and 5% CO2 with DMSO as ‘control negative’ and ellipticine as ‘control positive’. At the end of the experiment 10 μl of a stock solution of MTT (5 μg/ml in 1 × PBS) was added to each well, gently mixed and incubated for another 4 h. The plates were centrifuged at 1500 rpm for 5 min, and the supernatants were discarded; subsequently 100 μl of DMSO (stopping agent) was added. After formation of formazan, it was read on a microtiter plate reader (Versa Max Tunable multi-well plate reader from Sigma-Aldrich, Ahmedabad, India) at 570 nm and the percentage of cell viability was calculated using the following formula. The IC50 values were determined as described in previous section. To assess the chemical injury to erythrocytes due to the plant extracts (methanol, ethyl acetate and chloroform of leaf, stem and flower) of C. gigantea; 200 μl of erythrocytes were incubated with 100 μg/ml of the extract, the highest equivalent dose used in antiplasmodial assay. The experiments were conducted under the same conditions as that of the antiplasmodial assay. After 48 h of incubation, the assay was terminated and thin blood smears were prepared and fixed with methanol and air dried. These smears were stained with Giemsa stain and observed for morphological variations of erythrocytes under a light microscope. 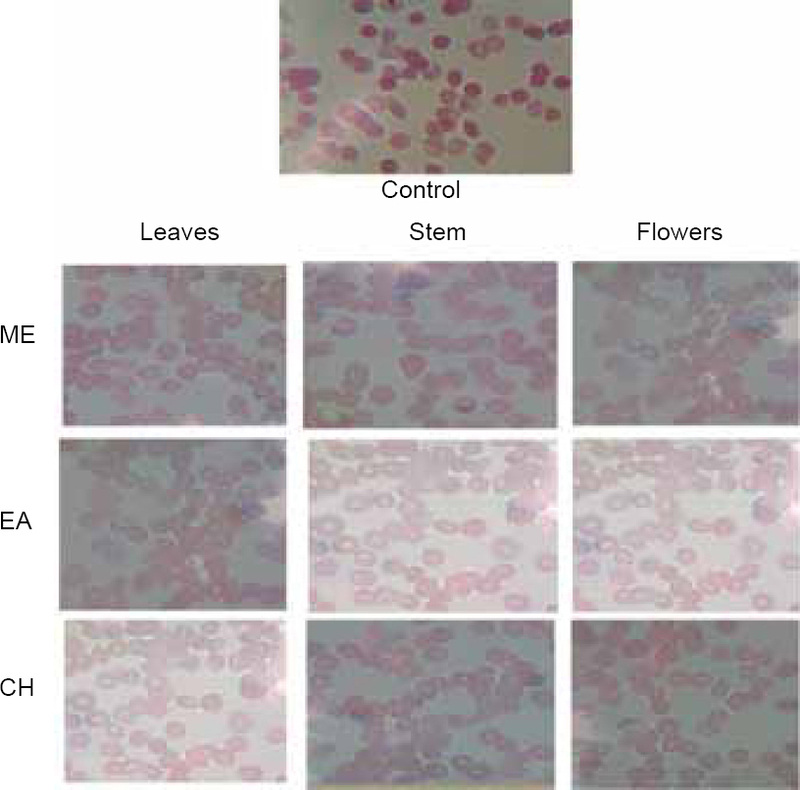 These morphological findings were compared with the normal erythrocytes of the control group. The methanol, ethyl acetate and chloroform of crude leaf, stem and flower of C. gigantea were first dissolved in DMSO to prepare a stock concentration of 50 mg/ml. The stock solution was then diluted in RPMI 1640 medium to make 10 mg/ml of working concentration for in vitro (P. falciparum and THP-1 cell line) studies. From the above working solution, different concentrations of crude extract such as 6.25, 12.5, 25, 50 and 100 μg/ml were prepared by serial dilution for antimalarial screening against chloroquine-sensitive P. falciparum 3D7 strain and to test cytotoxicity against THP-1 cell line and a working solution of 50 mg/ml was prepared for in vivo (mice) studies. The extract concentrations from 200 to 1000 mg/kg body weight were prepared in PBS for in vivo antimalarial activity against P. berghei in BALB/c experimental mice. Healthy BALB/c female mice aged 6–8 wk (25–30 g) were used for the present study (obtained from the Mahaveera Enterprises, Hyderabad, Telangana, India). The mice were fed on standard pellet diet and water was given ad libitum. They were housed in clean, dry polypropylene cages and maintained in a well-ventilated animal house with 12 h light/12 h dark cycle. The chloroquine sensitive P. berghei ANKA strain was maintained in vivo in BALB/c mice in the laboratory by weekly inoculation of 1×107 infected red blood cells in naïve mice. Then, the parasitaemia was counted with haemocytometer and the parasites were adjusted to 0.5 × 106 in PBS sterile solution. Each animal was injected intraperitoneally with 200 μl (0.2 ml) inoculum along with 0.5×106 parasites inoculated on first day, i.e. Day 0. For evaluating the methanolic leaf crude extract of C. gigantea, infected mice were randomly divided into seven groups of 5 mice/group. Group I to V were treated with the methanolic leaf extract at doses of 200, 400, 600, 800 and 1000 mg/kg respectively. The remaining two groups were maintained as control negative and control positive; and administered PBS and chloroquine with 5 mg/kg body weight/day respectively. This test was used to evaluate the schizonticidal activity of the methanolic leaf extract of C. gigantea against P berghei infected mice according to the method described by Peter et al. These infected mice were randomly divided into their respective groups as described above. Then treatment was started 3 h after mice were inoculated with the parasites on Day 0 and then continued daily for four days from Day 0 to 3. After completion of treatment, thin blood film was prepared from the tail of each animal on Day 4 to determine the parasitaemia and percentage of inhibition. Additionally, each mouse was observed daily for determination of survival time. Thin smears of blood were made from the tail of each mouse at the end of the 4-day suppressive test. These smears were fixed with absolute methanol for 15 min and stained with 10% Geimsa stain at pH 7.2 for 15 min and acridine orange. The stained slides were then washed gently using distilled water and air dried at room temperature. Two stained slides for each mouse were examined under Trinocular microscope (CHi 20, Bengaluru, India) and UV illumination microscope (Carl Zeiss, Bengaluru, India) with an oil immersion objective with 100× magnification. Five different fields on each slide were examined to calculate the average parasitaemia as mentioned below. Percentage of parasitaemia suppression of the extracts was calculated by the following formula. Based on Peter et al test, body weight of each mouse was measured before infection (Day 0) and on Day 4 using a sensitive digital weighing balance. The mean and standard deviations of the treated and control groups were calculated at 95% confidence intervals for inhibition, mortality, parasitaemia, body weight and PCV. The results were analyzed statistically by two-tailed student’s t-test to identify the differences between the treated group and control group using Minitab 11.12 software. The data was considered significant at p < 0.05 and p < 0.001. Ethics: Animal experiments were conducted in accordance with the guidelines of the Institutional Animal Ethics Committee of University College of Pharmacy, Acharya Nagarjuna University, Guntur, Andhra Pradesh, India (Approval Number: ANUCPS/IAEC/AH/P18/2016). 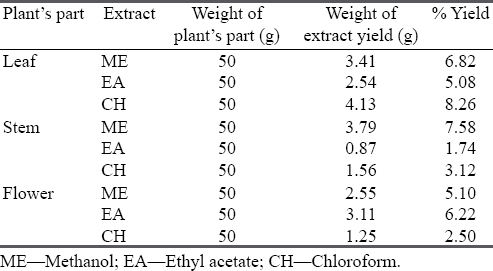 The weight of leaves, stem and flowers of C. gigantea extracted in methanol, ethyl acetate and chloroform are presented in [Table 1]. The phytochemical studies revealed that the methanol, ethyl acetate and chloroform extracts of leaf, stem, and flower of C. gigantea consists of a variety of phytochemical constituents, namely alkaloids, triter-penes, flavonoids, tannins, coumarins, carbohydrates, phenols, saponins, phlobatannins and steroids [Table 2]. These extracts were evaluated for their antimalarial potencies. The IC50 values of the tested plant extracts against P. falciparum are listed in [Table 3]. The in vitro antiplasmodial activity of biological active substances was categorized into four groups based on IC50 value. The IC50 values of the methanol, ethyl acetate and chloroform extracts of leaves, stem and flowers of C. gigantea were found to be in the range from 12.17–7μg/ml against chloroquine-sensitive P. falciparum strain. 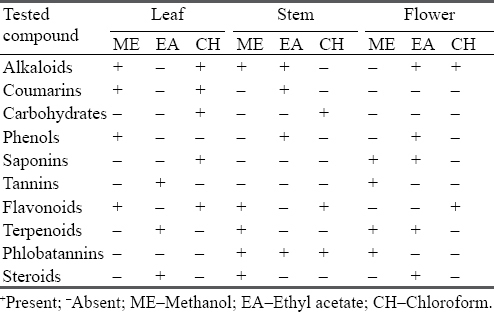 The methanol extracts of leaves (12.17 μg/ml), stem (44.47 μg/ml); ethyl acetate extract of leaves (22.05 μg/ml) and flower (41.66 μg/ml); and chloroform extract of leaves (33.28 μg/ml) showed good antimalarial activity and were significant at p < 0.05 and p<0.001. Among these extracts, the methanol extract of leaves showed highest antimalarial activity (IC50= 12.17 μg/ml). The chloroform extract of flower had lC50 value between 50 and 100 μg/ml. The chloroform extract of leaves and methanol extract of stem did not show any antimalarial activity with IC50 values >100 μg/ml. The IC50 value of the ethyl acetate extract of leaves could not be calculated due of it’s unclear inhibition. The microscopic observation of inhibition of P. falciparum during treatment of methanolic leaf extract of C. gigantea (100 μg/ml) is represented in [Figure 2] and [Figure 3]. The CPM after treatment of all the extracts of C. gigantea, at the highest concentration (100 μg/ml) are represented in [Figure 4]. Figure 2: Microscopic observations of P. falciparum (3D7 strain) inhibition after treatment with (a) DMSO or Control−; (b) Chloroform (Control+); and (c) C. gigantea methanol (CG MEL) leaf extracts at highest concentration (100 μg/ml) with Giemsa stain at 1000× magnification (R—Ring stage, T—Trophozoite, S—Schizont). Figure 3: Microscopic observations of P. falciparum (3D7 strain) inhibition after treatment with (a) DMSO or Control−; (b) Chloroform (Control+); and (c) C. gigantea methanol (CG MEL) leaf extract at (100 μg/ml) highest concentration with acridine orange at 1000× magnification (R—Ring stage; T—Trophozoite; S—Schizont). Figure 4: Comparison of CPM counts among control (DMSO treated), chloroquine treated and plant extract treated against P. falciparum 3D7 strain (Methanol leaf extract of C. gigantea showed low CPM similar to chloroquine). The in vitro cytotoxicity studies against THP-1 cell line were conducted for all the extracts. All the nine extracts had IC50 values > 20 μg/ml. The extract is classified as non-toxic when the IC50 value is >20 μg/ml. Hence, none of the plant extracts showed any toxicity in the in vivo studies. The selectivity indices also indicated the low toxicity of the tested extracts indicating that they are safer for therapeutic use [Table 4]. The microscopic observation of uninfected erythrocytes incubated with the extracts of C. gigantea and uninfected erythrocytes from the blank column of the 96-well plate showed no morphological differences after 48 h of incubation [Figure 5]. The results of the present study indicated that, methanolic leaf extract of C. gigantea has potent antimalarial activity against P. berghei as evidenced in the in vivo BALB/c experimental mice during 4-day suppressive test. 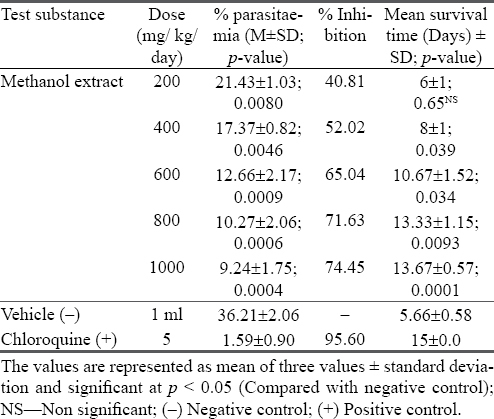 The methanol extract of leaf caused a moderately low (p < 0.05) and dose-dependent decrease in parasite counts, unlike the chloroquine treated group, while the control group showed a daily increase in parasitaemia. 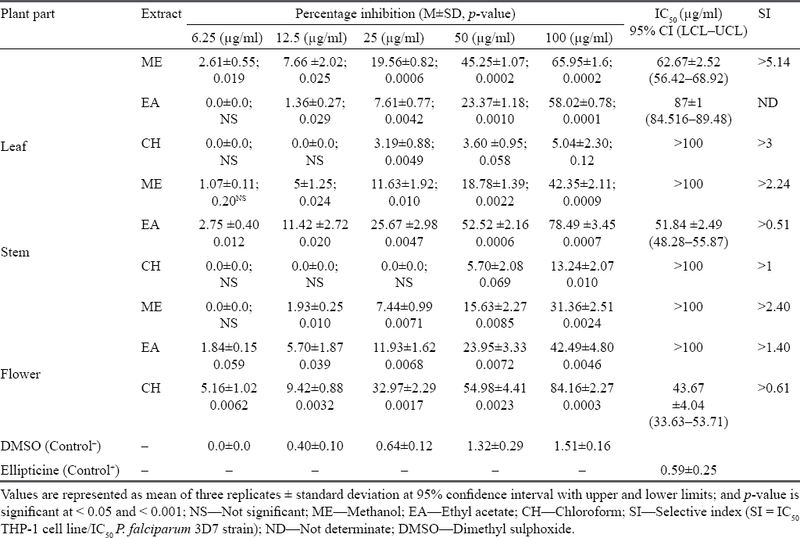 Figure 5: Screening for damage to erythrocytes after treatment with different crude extract of Calotropis gigantea at concentration of 100 μg/ml vs Control; ME—Methanol; EA—Ethyl acetate; CH—Chloroform. During the early infection, oral administration of 200, 400, 600, 800 and 1000 mg/kg body weight/day concentration of extract caused chemo-suppression of 40.81, 52.02, 65.04, 71.63 and 74.45% respectively which was statistically significant at p < 0.05 as compared to negative control. The standard drug chloroquine (5 mg/kg body weight/day) caused 96.50% chemo-suppression which was significant when compared to the extract treated groups [Table 5]. The highest concentration of the extract (1000 mg/kg body weight/day) showed 74.45% chemosuppression which was nearly similar to that of standard drug chloroquine. In vivo antiplasmodial activity can be classified as moderate, good and very good if an extract demonstrate percentage of parasitaemia suppression ≥50% at a dose of 500, 250 and 100 mg/kg body weight/day respectively. Based on this classification, it can be said that the methanolic crude extract of C. gigantea has good antiplasmodial activity. The comparative analysis of parasitaemia indicated that, methanolic leaf extract of C. gigantea showed significant difference on 4-day parasitaemia at all dosages when compared to the negative control. 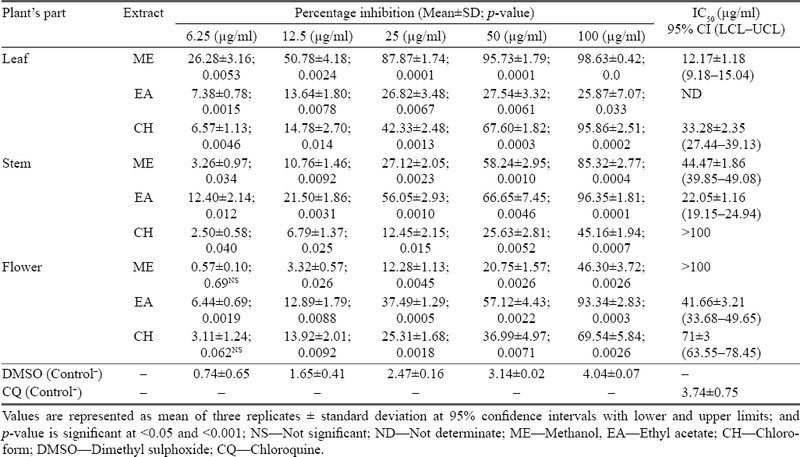 The lowest level of parasitaemia (9.24%) was observed at the highest dose (1000 mg/kg body weight/day) of methanolic leaf extract of C. gigantea [Table 5] and [Figure 6] which was statistically significant (p < 0.05). 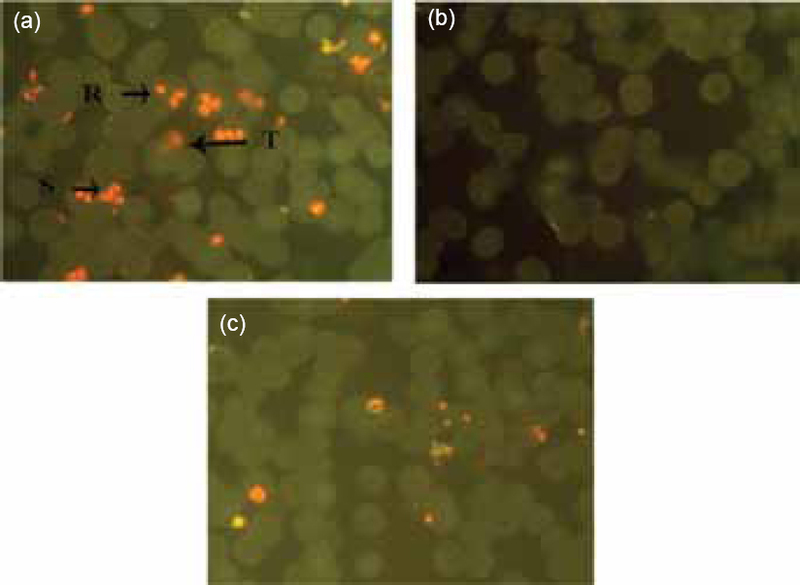 Figure 6: Microscopic observations after treatment with DMSO or Control (−) Chloroquine or Control (+); and C. gigantea methanol (CG MEL) leaf extract against P. berghei strain at highest concentration (1000 mg/kg body weight/day) with acridine orange (AO) and Giemsa (G) stain at 1000× magnification (R—Ring stage; T—Trophozoite; S—Schizont; WBC—White blood cell). The mean survival time (MST) of the chloroquine treated mice (positive control) was 15±0.0 day. The MST of infected mice (negative control) was five days. The MST of methanol leaf extract of C. gigantea treated mice at 200, 400, 600, 800 and 1000 mg/kg body weight/day was 6, 8, 10.67, 13.33 and 13.67 days respectively. 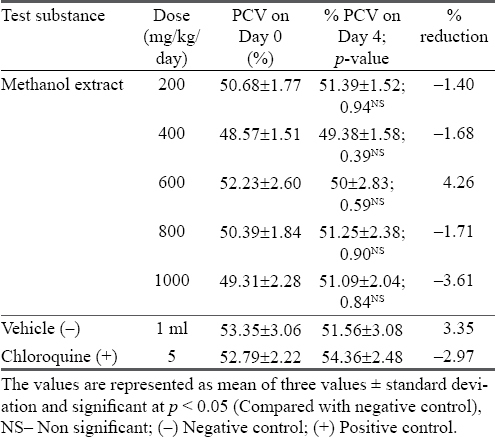 This was significantly longer (p < 0.05) than the value of the negative control mice which survived for only five days, but the effect was significantly lower than standard drug chloroquine treated mice (15 days) [Table 5]. 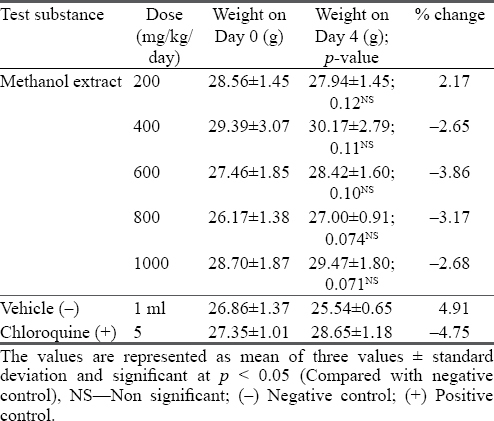 In 4-day suppressive test, all the doses of the methanol leaf extract of C. gigantea showed a preventive effect in weight reduction and normalized the weight in infected mice at all dose levels compared to ‘control negative’ mice and the increase in body weight was not dose-dependent [Table 6]. Also, the methanolic leaf extract of C. gigantea exhibited protective activity against the reduction in packed cell volume (PCV) levels, when compared to ‘control negative’ but it was not dose-dependent [Table 7]. In the present investigation, methanolic leaf extract of C. gigantea showed maximum antiplasmodial activity along with synergic effect of one or more phytochemicals, amongst all the tested extracts according to the Rasoanaivo et al classification. The results of the study are in consistent with the outcomes of peer researchers who reported the antiplasmodial activity of several plants including poly herbal extracts,,,,,,. Hence, this is the third report of the antimalarial activity of C. gigantea against chloroquine-sensitive P. falciparum 3D7 strain. Wong et al assessed the antiproliferative (APF) and antiplasmodial (APM) activities of five selected Apocyanaceae species including C. gigantea, wherein it was found effective against 3D7 strain, which correlates with this study. They also reported that the SI of C. gigantea is potentially safer for malaria treatment which corroborates with present finding. The excellent in vitro antiplasmodial activity of the plant extracts in the present study might be due to the presence of strong phytochemical constituents [Table 2] such as alkaloids, coumarins, phenols and flavonoids. Alkaloids are the major classes of compounds possessing antimalarial activity and quinine is one of the important and oldest antimalarial drugs which belong to this class of compound,,. It was interesting to note that the majority of the chloroform extracts did not show any activity. However, the ethyl acetate extracts showed better antiplasmodial activity out of the total extracts followed by methanol. In this study, some of the selected extracts did not showed in vitro antiplasmodial activity in an applicable range. A possible clarification could be, factors such as chemo-types, environmental parameters, harvesting and storage conditions that could collectively influence the plant metabolites prior to and following harvesting, which in turn would be reflected in the bioactivity. Some of the traditional medicine involves the use of crude plant extracts which contain an extensive diversity of molecules, often with indefinite biological effects. However, most of the available information regarding the medicinal potency of these plants is not provided with credible scientific data. For this reason, several researches have been conducting cytotoxicity assays to determine the toxicity of medicinal plants. A general bioassay that appears capable of detecting a broad spectrum of bioactivity present in plant crude extracts is THP-1 cell line. The cytotoxic effect in vitro against THP-1 cell line revealed that out of nine extracts, almost all showed IC50> 100 μg/ml. The cytotoxicity > 20 μg/ml is considered as non-toxic to animals which is safer for further studies. The SI of most of the extracts indicated non-toxicity during THP-1 cytotoxicity studies. Extracts with SI values > 10 offer the potency for safer therapy. In addition, none of the test extracts of plant caused any chemical injury/damage to the erythrocytic membrane throughout the study. Commonly, the erythrocytic membrane is a fragile structure that can be significantly altered by drug interactions. The mechanical stability of the erythrocytic membrane is an excellent indicator of cytotoxicity in in vitro studies since its structural dynamics favours interactions with drugs, and this signifies the possible use of these extracts as antiplasmodial drug. The mechanism of action is not clear, however, it might be due to the inhibition of haemozoin biocrystallization by the alkaloids and inhibition of protein synthesis by triter-penoids. The in vivo model was involved for this study for the reason that it takes into account the possible prodrug effect and possible involvement of the immune system in eradication of the infection. Plasmodium berghei ANKA was used in the prediction of treatment outcomes and for this reason it was an appropriate malaria parasite for the study. Several conventional antimalarial agents such as chloroquine, halofantrine, mefloquine and more recently artemisinin derivatives have been identified using rodent model. The 4-day suppressive test, which mainly evaluates the antimalarial activity of extracts on early infections was used in the study for determination of percent inhibition of parasitaemia. A mean parasitaemia level ≥ 90% to that of mock-treated control animals usually indicates that the test compound is active in standard screening studies. This study revealed that, the methanol leaf extract of C. gigantea has very high (p < 0.05) and dose-dependent chemosuppression. Anaemia, body weight loss and body temperature reduction are the common symptoms of malaria infected mice. Thus an ideal antimalarial agent obtained from plants are expected to prevent body weight loss in infected mice due to the rise in parasitaemia. Despite the fact that the increase in weight was not consistent with increase in dose, the crude extracts of tested plants significantly prevented weight loss associated with the decrease in parasitaemia level in the suppressive test. The preventive effect of extract might be due the presence of saponins, flavonoids, glycosides and phenolic compounds found in the crude extract. The PCV was measured to evaluate the efficiency of the methanol extract in preventing haemolysis due to escalating parasitaemia level. The fundamental cause of anaemia include the following mechanisms: the clearance and/or destruction of infected RBCs, the clearance of uninfected RBCs, and erythropoietic suppression and dyserythropoiesis. 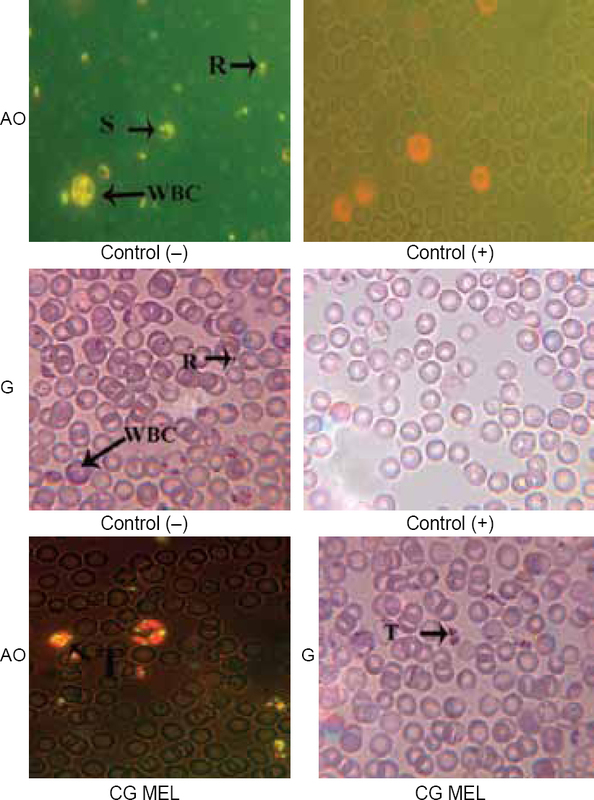 Each of these mechanisms are concerned with both human and mouse malarial anaemia. In the present study, the tested plant extracts did not show any preventive effect on PCV reduction in 4-day suppressive test. However, the reduction of PCV is in slight variation when compared to the controls. Drugs lead to decreased parasitaemia and subsequent recovery of symptomatic malaria. They also reduce parasitaemia through different ways like reducing parasite nutrient intake, interfering with parasite metabolic pathways like a haeme metabolic pathway which is involved in the metabolism of iron. Drugs also negatively influence the parasite reproduction and growth. In the present study also, the methanolic leaf extract reduced the level of parasitaemia and increased the mice survival time. The present observation is also supported by Chan and Bagai study, which reported that the ethanolic extract of the leaves of Ajuga bracteosa reduced the number of Plasmodium parasites in a mouse model. Earlier studies have shown that water and methanolic stem bark extracts of Zanthoxylum chalybeum have significant in vitro antiplasmodial activity against chloroquine-sensitive and -resistance strains of P. falciparum, which corroborates with the findings of the present study wherein the methanolic leaf extract of C. gigantea exhibited significant in vitro antimalarial activity. Ogbuehi et al have reported the suppressive, repository and therapeutic activity of the methanolic root extracts of Anthocleista noblis, Nauclea latifolia and Napoleona imperialis from medicinal plants in Nigeria responsible for reducing parasitaemia. Anosa et al studied in vivo antiplasmodial activity of ethanolic extract of stem bark of Enantiapolycarpa in mice, infected with Plasmodium berghei. The extract exhibited promising activity against both the early and established infection and achieved 75.8 and 72% chemo-suppression and increased the MST after administration. This is in support of this study where, the MST of the plant extract in 4-day suppressive test was 13.67 days with the highest doses (1000 mg/kg body weight/day). The MST rate was improved when the dose level increased during the study periods. Thus, the earlier reports on in vivo antimalarial activity strongly support and corroborates with the present findings, i.e. the methanolic leaf extract of C. gigantea has promising in vivo antimalarial activity in P. berghei infected BALB/c experimental mice. The present investigation revealed that, out of the nine extracts of the studied plant, C. gigantea, the methanolic leaf extract exhibited the most potent antimalarial activity against P. falciparum in vitro and against P. berghei in vivo. Moreover, these plant extracts exhibited no toxicity to THP-1 cell lines. Thus, the present work provides the scope of using these compounds for further therapeutic studies for new antimalarial drug formulations. More research is needed to identify and characterize the potent molecules that suppress the malaria parasite for development of new drug therapies in view of growing resistance to malaria. The authors are thankful to the Coordinator, Department of Zoology and Aquaculture, Acharya Nagarjuna University, Guntur (A.P. ), India for providing the necessary facilities through SAP-DRS-Phase II Funding by the University Grants Commission, New Delhi, India. White NJ. Qinghaosu (Artemisinin): The price success. Science 2008; 320: 2619–20. Kshirsagar NA. Malaria: Antimalarial resistance and policy ramifications and challenges. J Postgrad Med 2006; 320(4): 291–3. Mutabingwa TK. Artemisinin-based combination therapies (ACTs): Best hope for malaria treatment but inaccessible to the needy! Acta Trop 2005; 95: 305–15. Noedl H, Youry Se, Schaecher K, Smith BL, Sochet D, Fukuda MM. Evidence of artemisinin resistant malaria in Western Combodia. N Engl J Med 2008; 359: 2619–20. Sherman PW, Billing J. Darwinian gastronomy: Why we use spices? Bioscience 1999; 49: 453–63. Kirtikar KR, Basu BD. Indian medicinal plants. v III, 2nd edn. Dehradun: International Book Distributors 1999; p. 191–2; 420–2; 993–4; and 2045–7. Sofowora A. Medicinal plants and traditional medicine in Africa. Chichester, United Kingdom: John Willey and Sons Ltd. 1982. Kepam W. Qualitative organic analysis–Spectrochemical techniques (II edn.). London: McGraw Hill 1986; p. 40–58. Trager W, Jensen JB. Human malaria parasites in continuous culture. Science 1976; 193(4254): 673–5. Simonsen HT, Jesper BN, Ulla WS, Ulf N, Pushpagadan P, Prabhakar J. In vitro screening of Indian medicinal plants for antiplasmodial activity. J Ethnopharmacol 2001; 74(2): 195–204. Ravikumar S, Ibaneson SJ, Suganthi P, Gnaadesigan M. In vitro antiplasmodial activity of ethanolic extracts of mangrove plants from South-East coast of India against chloroquine-sensitive Plasmodium falciparum. Parasitol Res 2011; 108(6): 873–8. Rasoanaivo P, Ramanitrahasimbola D, Rafatro H, Rakotondramanana D, Robijaona B, Rakotozafy A, et al. Screening extracts of Madagascan plants in search of antiplasmodial compounds. Phytother Res 2004; 18(9): 742–7. Basim MA, Abdalla AA, Faris DM. In vitro inhibition of human leukemia THP-1 cells by Origanum syriacum L. and Thymus vulgaris L. extracts. BMC Res Notes 2014; 7: 612–8. Khonkarn R, Okonogi S, Ampasavate C, Anuchapreeda S. Investigation of fruit peel extracts as sources for compounds with antioxidant and antiproliferative activities against human cell lines. Food Chem Toxicol 2010; 48(8–9): 2122–9. Ouattara Y, Sanon S, Traore Y, Mahiou V, Azas N, Sawadogo L. Antimalarial activity of Swartzia madagascariensis Desv. (Leguminosae), Combretum glutinosum Guill. and Perr. (Combretaceae) and Tinospora bakis Miers (Menispermaceae), Burkina Faso medicinal plants. Afr J Tradit Complement Altern Med 2006; 3(1): 75–81. Chandel S, Bagai U. Antiplasmodial activity of Ajuga bracteosa against Plasmodium berghei infected BALB/c mice. Indian J Med Res 2010; 131: 440–4. Peter W, Portus H, Robinson L. The four-day suppressive in vivo antimalarial test. Ann Trop Med Parasitol 1995; 69: 155–71. Bantie L, Assefa S, Teklehaimanot T, Engidawork E. In vivo antimalarial activity of the crude leaf extract and solvent fractions of Croton macrostachyus Hocsht. (Euphorbiaceae) against Plasmodium berghei in mice. BMC Compl Altern Med 2014; 14(7): 79–89. Ravikumar S, Inbaneson SJ, Suganthi P, Venkatesan M, Ramu A. Mangrove plants as a source of lead compounds for the development of new antiplasmodial drugs from South-East coast of India. Parasitol Res 2011; 108(6): 1405–10. Musila MF, Dossaji SF, Naguta JM, Lukhoba CW, Munyao JM. In vivo antimalarial activity, toxicity and phytochemical screening of selected antimalarial plants. J Ethnopharmacol 2013; 146(2): 557–61. Gansane A, Sanon S, Ouattara LP, Traore A, Hutter S, Ollivier E, et al. Antiplasmodial activity and toxicity of crude extracts from alternative parts of plants widely used for the treatment of malaria in Burkina Faso: Contribution for their preservation. Parasitol Res 2010; 106: 335–40. Falade MO, Akinboye DO, Gbotosho GO, Ajaiyeoba EO, Happi TC, Abiodun OO, et al. In vitro and in vivo antimalarial activity of Ficus thonningii Blume (Moraceae) and Lophira alata Banks (Ochnaceae), identified from the ethnomedicine of the Nigerian Middle Belt. J Parasitol Res 2014; 2014: 6 (Article ID 972853). Kaushik NK, Bagavan A, Rahuman AA, Zahir AA, Kamaraj C, Elango G, et al. Evaluation of antiplasmodial activity of medicinal plants from north Indian Buchpora and south Indian eastern Ghats. Malar J 2015; 14: 65. Bandaranayake WM. Bioactivities, bioactive compounds and chemical constituents of mangrove plants. Wetlands Ecol Manag 2002; 10: 421–52. Wong SK, Yau YL, Noor RA, Fariza JN. Assessment of antiproliferative and antiplasmodial activities of five selected Apocynaceae species. BMC Complement and Altern Med 2011; 11: 3. Mazid M, Khan TA, Mohammad F. Role of secondary metabolites in defense mechanisms of plants. J Biol Med 2011; 3(2): 232–49. Saxena S, Pant N, Jain DC, Bhakuni RS. Antimalarial agents from plant sources. Curr Sci 2003; 85: 1314–29. Pothula VVS, Kanikaram S. In vitro antiplasmodial efficacy of mangrove plant, Ipomoea pes-caprae against Plasmodium falciparum (3D7 strain). Asian Pacific J Trop Dis 2015; 5(12): 947–56. Madara A, Ajayi JA, Salawu OA, Tijani AY. Antimalarial activity of ethanolic leaf extract of Piliostigma thonningii Schum. (Caesalpiniacea) in mice infected with Plasmodium berghei berghei. Afr J Biotechnol 2010; 9: 3475–80. Yen WJ. Possible anti-obesity therapeutics from nature: A review. Phytochem 2010; 71: 1625–41. Lamikanra AA, Brown D, Potocnik A, Casals-Pascual C, Langhorne J, Roberts DJ. Malarial anemia of mice and men. J Blood 2007; 110: 18–28. De Villiers KA, Egan TJ. Recent advances in the discovery of haem-targeting drugs for malaria and schistosomiasis. Molecules 2009; 14: 2868–87. Rukunga GM, Gathirwa JW, Omara SA, Muregi FW, Muthaura CN, Kirira PG, et al. Antiplasmodial activity of the extracts of some Kenyan medicinal plants. J Ethnopharmacol 2009; 121: 282–5. Ogbuehi IH, Ebong OO, Asuquo EO, Nwauche CA. Evaluation of the antiplasmodial activity of the methanolic root extracts of Anthocleista nobilis G. Don, Nauclea latifolia Smith and Napoleona imperialis P. Beauv. Br J Pharmacol Toxicol 2014; 5(2): 75–82. Anosa GN, Udegbunam RI, Okoro JO, Okoroafor ON. In vivo antimalarial activities of Enantia polycarpa stem bark against Plasmodium berghei berghei in mice. J Ethnopharmacol 2014; 153(2): 531–34.